Last sold in July 2009, the 35 metre classic sailing yacht White Heather is back on the market, renamed Aries and listed for sale by Heikki Luoma at Compass International. Built in Burmese teak on steel frames by British yard Camper & Nicholsons, Aries has a varied and interesting history. Her keel was initially laid in 1939, but with the onset of the Second World War and family circumstances she was mothballed and only finished and launched in 1952 for tobacco tycoon RJ Reynolds. Seven years later she was donated to the American Geographic Society, serving as an oceanographic research vessel in Bermuda. Little is known about what happened to her in the late sixties and seventies, but she appeared again in the early 1980s when Canadian Gene M Jensen restored her, fitting a new interior and a Bermudian rig. She now sleeps up to eight guests in four cabins comprising a master suite, two doubles and a twin, all with en-suite bathroom facilities. There are also quarters for four crewmembers aboard this yacht for sale. She has teak decks, Oregon pine masts and brass deck fittings. Guest areas include the deckhouse and saloon/dining area, which are decorated in the traditional style with wood panelling. Under power, a 300hp Cummins diesel engine allows a range of 2,000 nautical miles at her cruising speed of 8.5 knots. 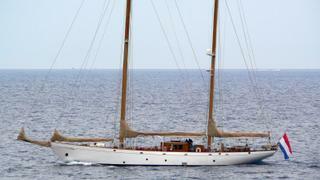 Aries is asking €750,000 with VAT paid.